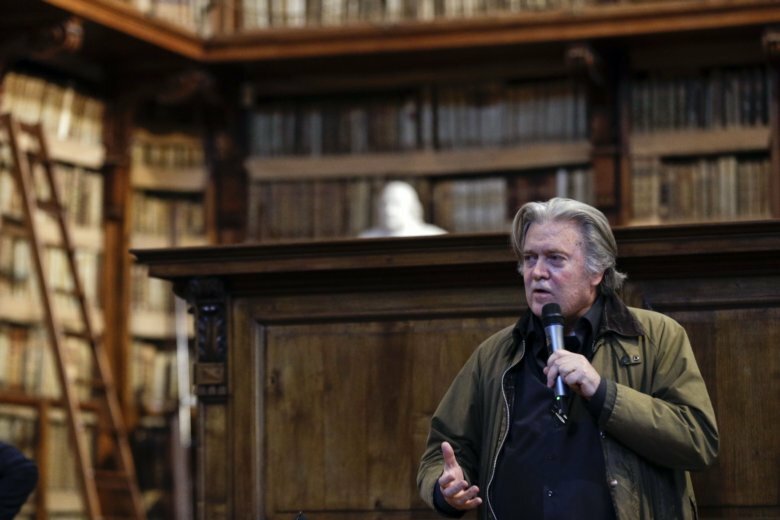 ROME (AP) — Former White House strategist Steve Bannon on Thursday predicted a “stunning victory” for populists and nationalists in the European Parliament elections in May and said they can achieve it without his help. Bannon has been trying to form a movement uniting populist and nationalist voters across Europe ahead of the May 23-26 elections. The reception from some European leaders has been lukewarm. “The politicians here don’t need me. They are fully capable of winning elections on their own,” Bannon said at an event at the centuries-old Angelica Library in Rome. He said the “populist, nationalist, sovereignty movement” has traction in Europe thanks to politicians such as Italian Deputy Prime Minister Matteo Salvini, Hungarian Prime Minister Viktor Orban and Austrian Chancellor Sebastian Kurz. “And that’s why it’s on the cusp, maybe, if the momentum keeps through Spain and other nations, of a stunning victory in May,” Bannon said. The American political strategist, whom many credit with helping Donald Trump win the U.S. presidency, set up a foundation in Brussels to help boost populist parties in Europe. French far-right leader Marine Le Pen invited Bannon to speak at a party congress last year but later said Europeans alone will shape the political direction of the continent. Italy’s Salvini also has kept his distance, saying Europe’s “diversity and originality” is not always understood on the other side of the Atlantic. Asked Thursday about next year’s U.S. presidential election, Bannon said he thought the biggest challenge to Trump would be a joint Democratic Party ticket of U.S. Sen. Kamala Harris of California and former U.S. Rep. Beto O’Rourke of Texas. However, he didn’t rule out former Secretary of State Hillary Clinton, the 2016 Democratic presidential candidate, aiming for a rematch with Trump. In a TV interview earlier this month, Clinton said she won’t run for president in 2020.